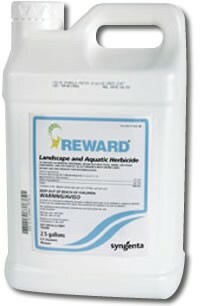 Reward herbicide is fast acting and broad spectrum on submersed weeds , especially effective on elodea, Eurasian watermilfoil , coontail and duckweed. Recommended highly for ponds and along lakeshore areas. It is absorbed by target plants in just minutes with no toxicity to fish or wildlife. No Swimming Restriction. Sample 100ft x 100ft Lakeshore Lot or Pond (.23 Acre)(4' avg. depth) Submerged weed control. Sample 148ft x 148ft Lakeshore Lot or Pond (.50 Acre)(4' avg. depth) Submerged weed control. Sample 100ft x 100ft Pond (.23 Acre) Duckweed control. Water Use Restrictions: None on Swimming or Fishing. Irrigation 5 Days. *Consult Label for Exact Doses, Additional restrictions & Important Application Directions. The Reward Herbicide Product Label is available for download in pdf.